The recent registration of a Bible Society in Azerbaijan, after a 20-year fight, has brought fresh optimism to the country’s minority Christians, but there remains some confusion about the types of books it will be allowed to print, with even Bibles potentially falling foul of the country’s strict regulations. Terje Hartberg from United Bible Societies, which has spearheaded the fight for the past two years, called it “a great development, which will start a new chapter in Bible ministry for all Christians in Azerbaijan”. However, all literature either printed or imported by the Bible Society will remain subject to approval by the government – with every publication labelled with an official sticker – and its distribution permitted only at state-approved venues. Those who distribute any religious literature outside these strict limitations face administrative or criminal punishment, reports Forum 18, a news agency focused on religious freedom in Central Asia. You can’t publish, print, import or distribute any religious publication without prior permission from the State Committee, which will also set numbers allowed. So nothing is approved until it is approved. The Old Testament and Hebrew Bible, meanwhile, remain amongst the list of “banned” books: text from these parts of the Bible have been confiscated in police raids, according to Forum 18. Asked whether the prohibition of the Old Testament in effect bans the Bible too, Forum 18’s Felix Corley told World Watch Monitor by email: “Well, you can’t publish, print, import or distribute any religious publication without prior permission from the State Committee, which will also set numbers allowed. So nothing is approved until it is approved. As a new chapter opens for the Bible Society in Azerbaijan, the country itself may be entering a new, more restrictive period. President Ilham Aliyev, following the example of his counterparts in Turkmenistan and Tajikistan, is seeking to change the constitution to allow for longer terms in office and no age boundaries. Aliyev, 54, has been President since 2003, when he succeeded his ailing father. Critics suggest the referendum, held on 26 Sep., was an attempt by Aliyev to secure the rule in perpetuity of his family. Voters were asked to “reject” or “approve” 29 separate amendments to the constitution, including extending maximum Presidential terms from five to seven years and the addition of two Vice Presidents to be chosen by the President. The minimum age for a President would also be abolished and the age for election to Parliament reduced from 25 to 18. Critics have suggested Aliyev may have earmarked the first Vice President post for his wife, Mehriban – currently Deputy Chairwoman of the ruling New Azerbaijan Party – or their son, Heydar, who is 19. In other proposed amendments, the President would be able to hold early elections or dissolve Parliament. Meanwhile, if Aliyev were to fall ill, his powers would pass to the first Vice President, rather than to the Prime Minister. The results of the election are due by 21 October. Voter turnout was said to be 63% – more than double the required 25% to validate the vote. 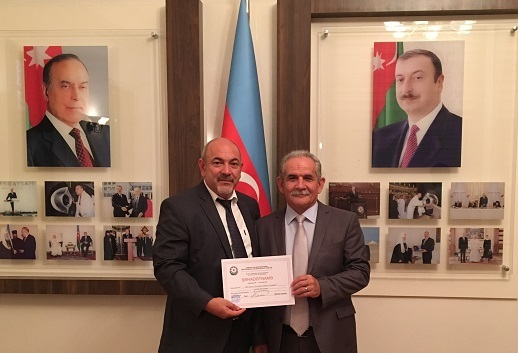 On 30 Sep., Ogtay Asadov, the Speaker in the Azerbaijan Parliament, said the turnout indicated the people’s “strong support” for the President and that the referendum was “valid”. Democracy is something that Azerbaijan has never known. The regime in Baku is just another post-Communist authoritarian bunch of rulers that are only after consolidating their position. However, opposition groups criticised the proposed changes as “undemocratic” and “monarchical”, while five prominent human-rights activists sought to block the referendum by appealing to the Council of Europe. Intigam Aliyev, Rasul Jafarov, Anar Mamedli, and Leyla Yunus, Emin Guseynov – all of whom have faced jail or exile for their criticisms of the government – argued the amendments contravened “human rights and the supremacy of law”. “The current regime’s intolerance of criticism and the continuing restrictions on the media and on freedom of expression and assembly … render impossible a balanced evaluation of the proposed amendments and acquainting voters with them prior to holding the referendum,” they wrote. In response, the Council of Europe’s Venice Commission said the referendum had been called without a proper debate in Parliament and that the proposed changes would give “unprecedented” control to the President. But Shahin Aliyev, head of the Presidential legal department, called their response “flawed” and “politically driven”. “They speak to us in a language of ultimatums,” he said at a briefing in the capital, Baku. The Classic Azerbaijan Popular Front had called for a boycott of the referendum, while the Musavat opposition party had launched a petition against it – but that was refused after 3,500 of the more than 40,000 signatures were labelled “invalid” by Azerbaijan’s Central Election Commission. “Democracy is something that Azerbaijan has never known,” according to Rolf Zeegers, analyst at the World Watch Research unit of Open Doors, which monitors treatment of Christians worldwide. “The regime in Baku is just another post-Communist authoritarian bunch of rulers that are only after consolidating their position. “They are in perfect line with the different regimes in Uzbekistan, Turkmenistan, Tajikistan and Kazakhstan. However, Zeegers said he didn’t believe the proposed changes would have “serious consequences” for the Church. Tajikistan, which, like Turkmenistan, has already approved constitutional amendments to allow for longer Presidential terms, has closed its last madrasa for 16-18-year-olds, in line with the strict rules introduced in the 2009 Religion Law. And while the impact on Christians is indirect, Open Doors’ Zeegers still said the overall “climate” is changing. “Tajikistan used to be rather relaxed towards religion until 2009,” he said. “The fact that the largest religious group in the country (Muslims) were able to openly and officially run religious schools is a very good indication for this. Since 2009, the regime in the Tajik capital, Dushanbe, has become much more authoritarian: all political opposition has been banned and legislation has become more restrictive. In August 2011, more laws were passed that prohibit any [ministry to] youth. Meanwhile, in Kazakhstan, President Nursultan Nazarbayev has called for the establishment of a Ministry for Religious and Civil Affairs. According to the website of the Kazakh Presidency, the Ministry will vouchsafe freedom of religion. Zeegers said the announcement is “remarkable” but also “possibly dangerous”. “Remarkable, because Kazakhstan is a secular country in which state and religion have been strictly separated,” he said. “[And] if there is a strict separation between state and religion, why form a special ministry for religious affairs?